James is back at Eton and he is feeling restless. Though the events of the summer were quite terrifying at times, they were at least interesting and exciting. Being at school again and slogging away though boring lessons for days on end is making him feel edgy and eager for the Christmas holidays. But before that joyous time arrives something happens which throws James' world into a state of turmoil. It all begins when one of the masters at Eton suddenly leaves without warning. The master, Professor Alexis Fairburn, writes a letter to Pritpal, one of James' friends. The letter makes no sense at first, but with the help of others James and Pritpal begin to figure out what Fairburn is trying to tell them. Using the techniques used in crossword puzzles to hide his meaning, Fairburn indicates that he is in trouble. He needs help and James decides to do what he can to provide that help. James discovers that Fairburn was kidnapped and that a former college friend of his, a Mr. Charnage, is not at all what he seems. Charnage is up to his neck in nefarious activities and he has blood on his hands. Given half a chance he would love to add James' name to the list of those he has killed. In this third young James Bond thriller, James once again finds himself in some very tricky situations. His adversary is wily and very powerful and James is hard pressed to stay ahead of him. Readers who have read and enjoyed the first book in this series, Silverfin, will be delighted with the return of Red, the streetwise boy whom James helped in the Silverfin adventure. This time Red, along with his very colorful family, is the one who does the helping, stepping up to assist James when he has no where else to turn to. 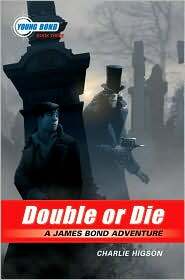 Full of thrills and chills – including a memorable scene in a foggy graveyard at night – this is book which fans of adventure titles will greatly enjoy.